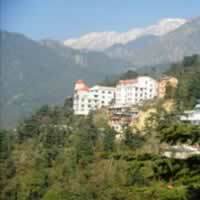 Surya Resort is situated at Mcleod Ganj, close to the headquarters of the Dalai Lama. 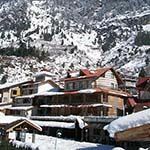 It is surrounded by pine and oak forests and offers panoramic mountain views. 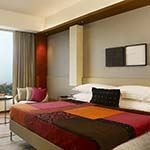 Guest rooms are elegantly furnished with many modern facilities including satellite TV, with each room having wonderful views. The Tibetan-style Oriental Restaurant is decorated with dragon motif wall paintings. 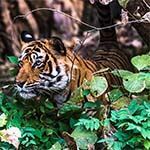 Jim's Jungle Retreat is an eco-sensitive wildlife lodge situated on the southern border of Jim Corbett National Park, once a royal hunting ground and now a famous tiger reserve. 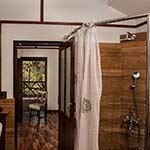 The en-suite cottages are set in 15-acres of lush vegetation, each with a private veranda with forest and mountain views. 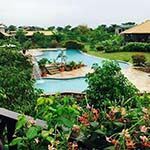 The lodge has a swimming pool and bird watching is outstanding. 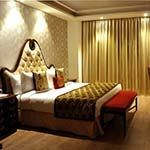 Lalit Grand Palace is a luxury 5 star hotel overlooking beautiful Dal Lake in Srinagar. 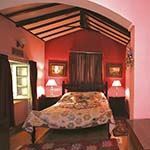 Formerly the residence of the Maharaj, this heritage hotel has been restored to its former glory and offers tastefully furnished luxury guest rooms, suites and cottages. 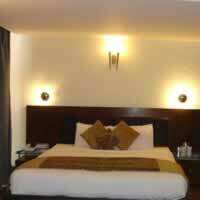 All rooms have satellite TV, minibar and tea/coffee facilities. 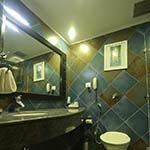 Hotel facilities include four restaurants,a bar, spa and health club, gym, tennis courts and indoor swimming pool. 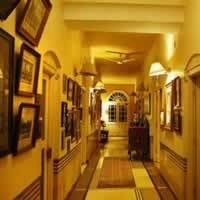 Ranjit Svaasa is a luxurious spa retreat housed in one of Amritsar's oldest mansions. 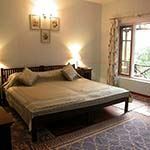 Dating back over 200 years, it provides yoga and meditation sessions, a fitness room and other wellness therapies. 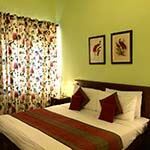 Designed with traditional Indian fabrics and warm colour tones, each air-conditioned room has tea/coffee facilities and personal safe. En suite bathroom feature a hairdryer and free toiletries. Free Wi-Fi is also available. 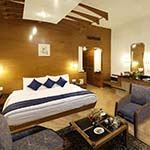 Hyatt Regency is one of the most luxurious hotel in Amritsar, conveniently situated near the Golden Temple. Guest rooms and suites are sleek and contemporary, with wonderful city views and the highest levels of comfort. 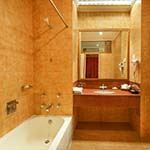 Each air conditioned room has a marble bath, walk-in shower, bath robes, hairdryer, safe, minibar, TV and coffee maker. There is also free WiFi. ThaiChi Restaurant offers specialty Thai and Chinese dishes and Collage offers international cuisine. The Lounge Bar and Pastry Shop offer a variety of freshly baked cakes, pastries and savory dishes. The hotel also has a luxury spa. 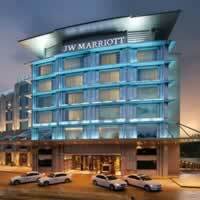 JW Marriott is a luxury hotel situated in Chandigarh, offering a fitness centre, spa and rooftop swimming pool. Guest rooms are open plan, with deluxe amenities and wonderful views. There are several fine dining restaurants in the hotel, offering an array of unique culinary experiences. 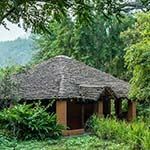 Vanghat is a small secluded eco-lodge situated on banks of the Western Ramganga River, on the northern edge of Jim Corbett National Park. Access to this wilderness paradise is by walking 1.3-miles (2 km) across country, followed by a bamboo-raft river crossing. 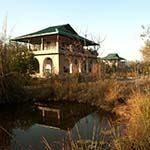 It is an ideal location for birding, photography, fishing and viewing wildlife on foot. 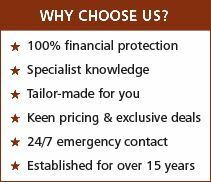 Accommodation is in en-suite thatched clay cottages, raised above the ground to allow wildlife to pass by unimpeded. 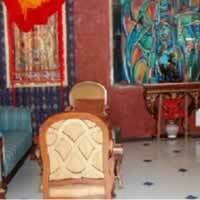 Furnishings are in wood, inspired by the traditional Vangujjar tribal. 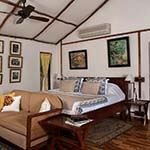 Each cottage has a ceiling fan and a large viewing veranda. Deicious locally sourced dinners are served by candlelight. 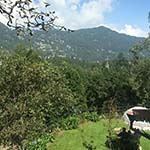 Indraprastha is a luxury boutique hotel and spa situated in Dharamshala, with glass-fronted rooms that provide sweeping views over the surrounding forests and mountain peaks. All guest rooms and suites have rich contemporary interiors, with private balconies and large picture windows framing the dramatic mountain scenery. Other facilities include TV, safe, minibar and free WiFi. 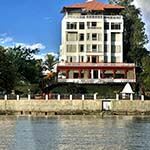 The multi-cuisine restaurant offers fine dining and there is also a coffee shop and welcoming bar. 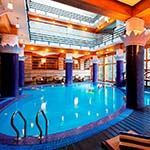 There is a tranquil spa with sauna and a swimming pool. 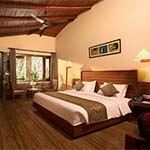 Tree Tops Riverview is a comfortable hotel situated on the banks of the Ramganga River in Jim Corbett National Park, in the foothills of the Himalayas. The spacious en-suite guest rooms have simple modern décor with king-size beds, seating area and mountain views. Satellite TV, hairdryer and complimentary toiletries are provided. There is also an outdoor swimming pool, lovely garden and restaurant serving international cuisine. 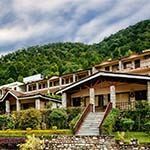 Aahana (meaning 'first rays of the sun') is a luxury eco-friendly resort situated at the edge of Jim Corbett Tiger Reserve in Uttarakhand, overlooking the Bijrani forest. 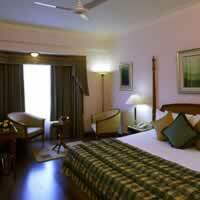 Guest rooms have elegant plush interiors which are spacious and light. 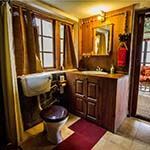 Each is en-suite with tea/coffee maker, minibar, safe, Wi-Fi, satellite TV and air-conditioning. 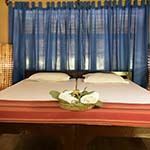 You can dine in the multi-cuisine restaurant that serves new age Indian and Kumauni dishes including vegan options, have a treatment in the spa, take a yoga class or enjoy the swimming pool and jacuzzi. 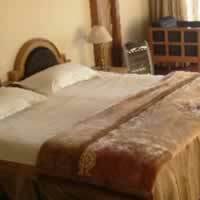 The Grand Dragon offers luxury accommodation in the high altitude town of Leh, overlooking the famous Cold Desert. All modern guest rooms enjoy views of the mountains and each room has air-conditioning, TV, free WiFi and en-suite bathroom with shower. 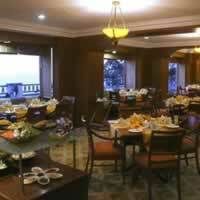 The restaurant serves Kashmiri, Indian, Chinese and European dishes and the Coffe Shop serves light refreshments. This eco-friendly hotel is fitted with solar panels. 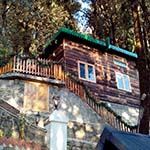 Manuallaya is a picturesque spa resort in Manali, set in six acres of landscaped gardens high in the Himalayas Mountains. Each modern luxury en-suite guest room has a satellite TV, frige and individual room temperature control. 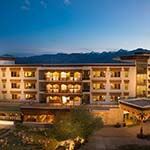 All front facing rooms have large private balconies providing a clear view of the snow clad mountains and the river. Laminated wooden flooring provides a rich and cozy feeling. 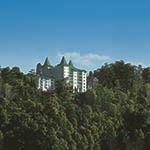 Fortune The Savoy is a luxury heritage property situated in the Mall Road in Mussoorie, with magnificent views of the snow-capped Himalayas and an enchanting view of the Doon Valley. Guest rooms are decorated in soft colours, using traditional English designs. 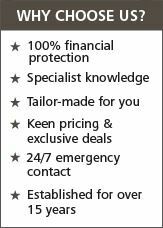 Facilities include the latest technology as well as satellite TV, safe, tea/coffee facilities, hair dryer, minibar & WiFi. 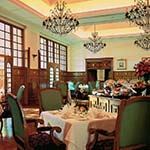 The Grand Dining Room offers an extensive menu and you can relax at Nostradamus – The Writer’s Bar. Other facilities include a gym and spa. 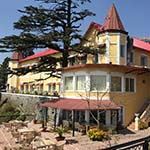 Kasmanda Palace is a heritage hotel situated in a foothills of the Himalayas, in the hill station of Mussoorie. Originaly part of Christ Church complex built by Captain Rennie Tailour of the Bengal Engineeres, this yellow villa dates from 1836 and is one of the oldest buidling in town. 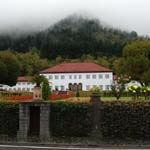 It has served as a sanatorium, school and the summer retreat of the royal fam ily of Kasmanda. 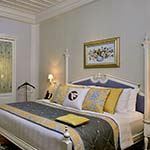 Today it offers warmly decorated and airy rooms, featuring wooden floors. 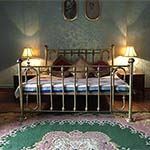 Upgraded rooms have antique-style sofas and tables, some with a 4-poster bed. The casual restaurant overlooks the valley, with terrace dining. 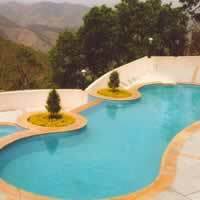 There is also a large outdoor swimming pool and a lovely garden to enjoy. 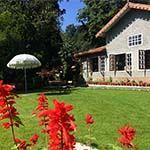 La Villa Bethany is an old English cottage nestled in an acre of woodlands in Landour, in the Mussoorie region. 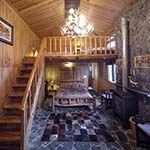 This small boutique guest house has tastefully designed deluxe rooms & suites, as well as a family log cabin. 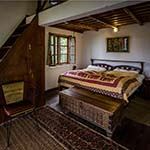 Owned and run by the Kudle Family, this homestay provides the opportunity to experience local cuisine, traditions and lifestyle. Faciliilites include free WiFi, TV, fridge and tea/coffee maker. 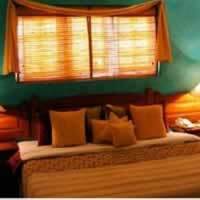 Jungle Lore Birding Lodge offers simple but comfortable accommodation in the small village of Pangot. 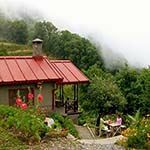 The rustic cottages are nestled in a natural forest on a mountain slope, allowing you to immerse yourself fully in nature. 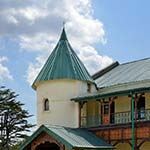 Each cottage is en-suite and has an outdoor veranda. 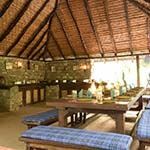 There is no WiFi or mobile phone connectivity at this lodge, which is a birder's paradise with specialist guides. 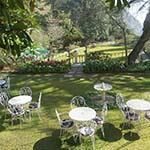 Abbottsford House is a comfortable heritage hotel situated in Nainital, with stunning views of the forested hillsides and mountains. 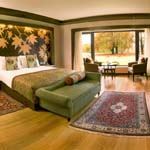 Guest rooms are full of natural light and feature wooden floors, en-suite bathroom and both antique and contemporary furniture. Satellite TV, free Wi-Fi and toiletries are provided. 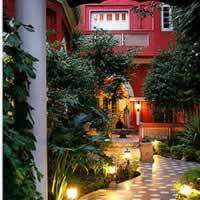 You can relax in the gardens and dine in the restaurant that serves Indian, Italian and European cuisine. 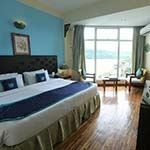 Ganga Kanari (meaning 'on the banks of the Ganges') is a riverside boutique hotel situated in Rishikesh. 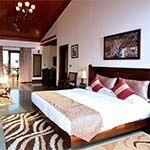 The resort overlooks Rajaji National Park, with its diverse flora and fauna. It has a waterside esplanade where guests can stroll alongside the sinuous river, soak in the sight of the mountains and revel in the lush surroundings. Ganga Kanari is an important centre for yoga, having hosted International Yoga Weeks on several occasions. 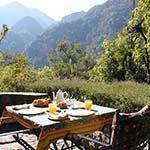 Himalayan Hideaway is a serene boutique lodge situated on a sloping hillside near Rishikesh, facing the River Ganges which flows below and looking out towards the Himalayas Mountains. 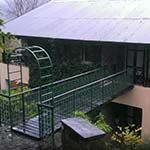 Accommodation is in quaint guest rooms and cottages, each named after a well known mountaineer from the region. The rooms are built in natural stone and set in forest surrounding, with cobbled pathways. Rooms are spacious, with meshed doors and windows. The restaurant offers quality Indian cuisine and some Continental options. This calm and tranquil setting is ideal for yoga and meditation. 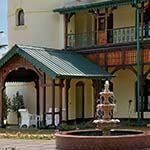 Clarkes is a gracious heritage hotel that embodies the elegance and charm of yesteryear. 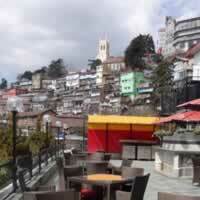 It is one of the oldest hotels in Shimla, with all modern conveniences. 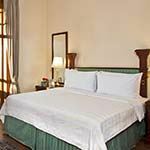 The spacious rooms and suites have a British colonial ambience and offer spectacular views of Shimla’s Mall Road or the surrounding mountains. 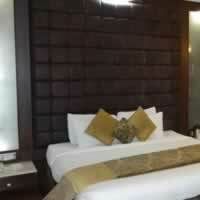 Facilities include WiFi, satellite TV, tea/coffee facilities, safety deposit box and minibar. The Dining Hall, built during the times of the Raj, serves a variety of Indian, European and Chiness cuisine. You an also dine al fresco on the outdoor terrace. 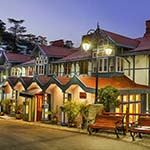 Combermere Hotel is located in the heart of Shimla town, level with the Shimla Mall and offering warm hospitality and great service. The architecture of the hotel is a synthesis of traditional & modern, with each en-suite guest room having TV, minibar and free toiletries. There is also a fitness centre and free Wi-Fi. 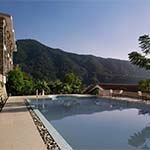 Radisson Jass is a rejuvenating retreat amidst the breathtaking scenery of the Himalayas Mountains. 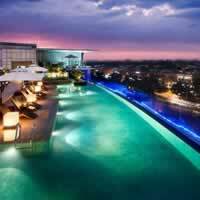 Indulge in the spa, try out the fitness centre and swimming pool or enjoy gourmet dining options. 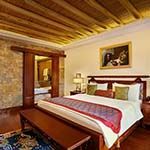 Guest rooms offer stylish decor, modern furnishings and beautiful views of the Himalayas. Also many in-room amenities such as free high-speed Internet access, electronic safe and mini bar. 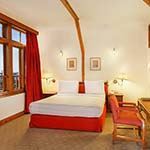 Oberoi Ceceil is a luxury heritage hotel nestled in the mountains of Shimla. 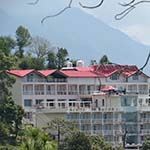 Located near the Viceroy Lodge, at the end of the Mall Road, this was the most exclusive hotel in the town during the time of the British Raj and famous for its ballroom dances. Today it retains much of its colonial charm, with its white facade and green terrace railings. Inside the lobby leads to a comfortable lounge, lit from above by a huge skylight that spans the signature atrium. 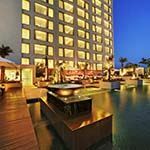 The hotel has all the facilities of a luxury hotel, including a fine dining restaurant situated in the grand ballroom. 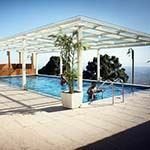 There is also a spa offering a wide range of Oriental and signature Oberoi treatments, with fantastic views.